Marc Piollet and Piotr Beczala are regularly working together with pleasure. At the moment both are on a tour with opera arias including extracts from Verdi’s Luisa Miller, Puccini’s Tosca and Turandot aswell as Bizet’s Carmen: After a first stop beginning of November in Dublin with the RTE Orchestra, the tour continues on November 24 in Barcelona with the orchestra of the Teatro del Liceu, where Marc Piollet lately conducted Puccini’s La Bohème, and finally on November 30 at Palau de la Música with the Valencia Orchestra. Marc Piollet is a regular guest at Teatro Real Madrid and will be back from October 12 onwards. This season brings the first guest performances of the Deutsche Ballett am Rhein: Together with the choir and the orchestra of Teatro Real they bring Brahms’ Deutsches Requiem on stage under the direction of Martin Schläpfer. 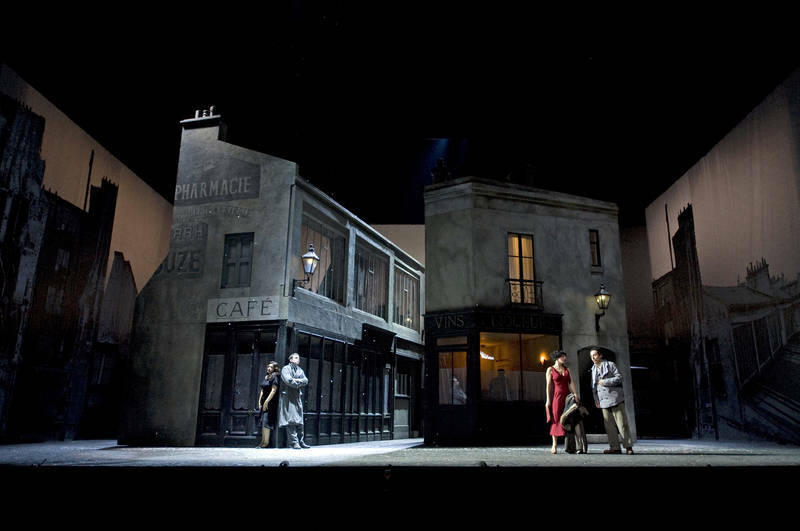 La Bohème from Teatre Liceu under the direction of Marc Piollet on October, 14, starting 8.30 pm on Mezzo TV! Marc Piollet returns to Teatre del Liceu in Barcelona. In June and July he will be conducting Puccini’s La Bohéme (premiere: June 18). The production of Jonathan Miller is shown at Liceu for the first time, in 2015 it had its premiere at English National Opera. Marc Piollet knows La Bohème very well, he has conducted the opera many times, a.o. with Anna Netrebko as Mimi at Royal Theatre Copenhagen. At Gran Teatre del Liceu in Barcelona Marc Piollet has already conducted Carmen in the setting of Calixto Bieito with Roberto Alagna as José and Erwin Schrott as Escamillo; the highly acclaimed production was published by Unitel Classica/C major 2011 on DVD. In Spain Marc Piollet is also very well known at Teatro Real. The last time he conducted Wagner’s Tristan und Isolde in the spectacular production of Peter Sellars and Donizetti’s L’Elisir d’Amore. He did also Massenet’s Don Quichotte and the sensational dancetheatre-production C(h)oeurs by Alain Platel which was then shown at various important theatre houses in Europe and which is now available on DVD. In Spain Marc Piollet also conducted gala concerts with Piotr Beczala at Teatro Real and at Festival Peralada in Catalonia. Marc Piollet est un chef d’une grande ouverture d’esprit: Il ne dirige pas seulement régulièrement des productions d’opéra, souvent avec les plus grands chanteurs, mais s’engage également pour le travail avec la jeunesse musicale, particulièrement avec la «Junge Sinfonie», un orchestre de jeune qu’il avait créé en 1989. Sa grande envergure de direction se relève dans un court métrage de 2015 réalisé par le metteur-en-scène Bernhard von Hülsen. Un portrait qui donne des aperçus formidables dans le travail et les pensées de Marc Piollet ! Marc Piollet is conducting Franz Lehár’s Merry Widow at Oper Köln on New Year’s Eve. Further performances take place on January 2 and 4. At the beginning of last season he has already conducted the acclaimed production of Dieter Hilsdorf’s Eugen Onegin in Cologne. Le 11 juillet Marc Piollet ouvre le Festival Castell de Peralada en Catalogne. Le programme se compose d’airs d’opéra interpretés par Piotr Beczala et Erika Grimaldi. D’ailleurs, en octobre Marc Piollet aura un autre concert avec Piotr Beczala et l’Orquesta Sinfónica de Madrid au Teatro Real. En Allemange, Marc Piollet dirige en juillet aux Ludwigsburger Schlossfestspielen à l’occasion du 20ème Classique Open Air avec un feu d’artifice et des airs connus de Rossini et Offenbach. Les solistes sont Emma Pearson et Martin Mitterrutzner. Marc Piollet fait son début aux Etats-Unis: Carmen de Bizet à Cincinnati Opera, la première a lieu le 12 juin! Marc Piollet avait dirigé Carmen entre autres au Théâtre Liceu à Barcelone, documenté sur un enregistrement DVD fantastique, avec Béatrice Uria-Monzón, Erwin Schrott et Roberto Alagna (Unitel) dans une mise en scène de Calixto Bieito. Maintenant, c’est parti pour la mise en scène d’Alain Gauthier à Cincinnati!